I wanted to do something different. I was kind of bored doing P90X, so I started following people on Instagram that were doing different sports. That's when I got the idea of triathlon. As I said on my first post, I was not very sporty person so why did I choose triathlon as my new challenge?. First, I love to be on the water (even though I was not a swimmer), second I always though biking was very fun (I was a terrible biker) and third, I hated running (I always thought running was very hard). My odds with this sport were very low, but I was determined to give it a try. 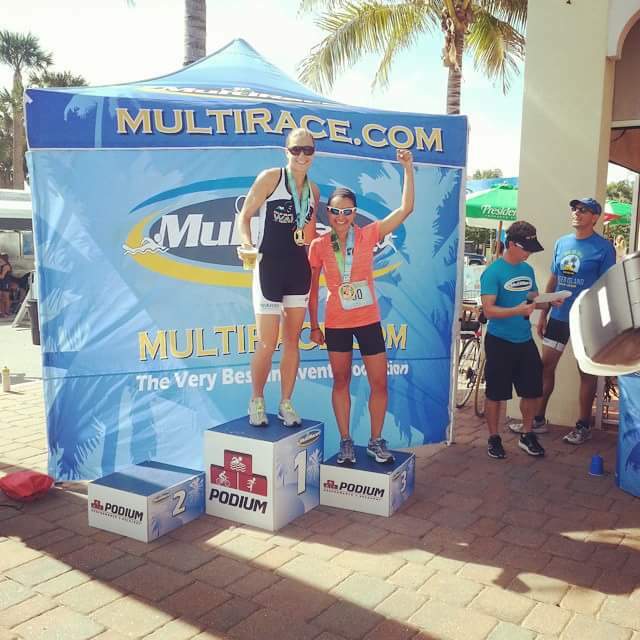 I started reading about everything involved with triathlon, and training was the first thing I had to set up if I wanted to finish the shortest distance. By the way, for those who are not familiar with this discipline, there are four different distances. The Sprint distance (1/2 mile swim, 10-13 miles bike, 3.1 miles run), the Olympic distance (1.5 K swim, 25 miles bike, 6.2 miles run), Half Ironman (1.2 miles swim, 56 miles bike, 13.1 miles run) and full Ironman (2.4 miles swim, 112 mile bike, 26.2 miles run). Looking around for triathlon clubs, I found RW Team with head coach Richard Wygand. I research him before, read his blog, and all his career as a triathlete. He is very impressive, very good athlete and inspired me. I contacted him and in matter of weeks I started my training. Oh! I said weeks, because triathlon is a very high gear sport. I had to buy my gear for swimming, biking and running. The first weeks of training were very hard, first getting used to wake up at 5:20 am to go training, second dealing with all muscle pains, and third discovering my that my body needed more calories (I was hungry all the time). At the beginning, I was very slow at everything. I could not swim 50 yards without stopping, I could not bike over 12 mph and running, and oh running? it happened that I wasn't that bad at running, not for a beginner. Little by little I started making progress, I could do 300 yards without stopping, I could bike at 15 mph and I could run at 10 minute per mile. Seeing my body responding to the hard training made me very happy and motivated me to keep going. 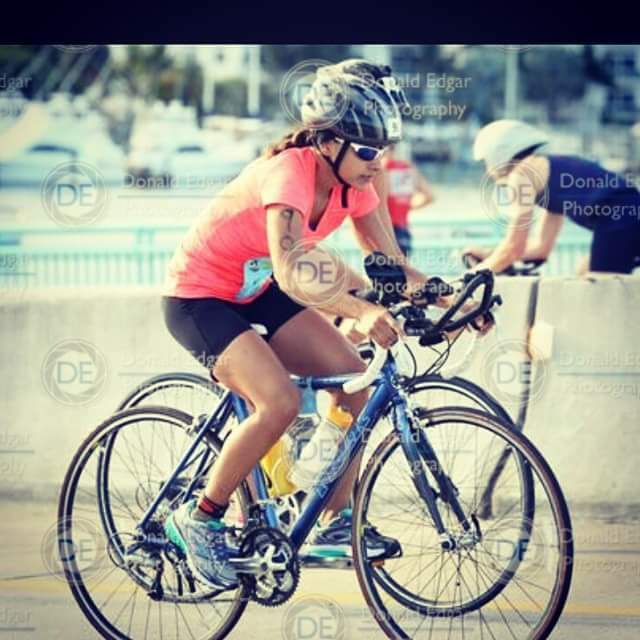 The big day came in, ... my first race! It took place on May 30th, 2015. Very anxious, excited and happy, many emotions all in one body. My only purpose: finish without dying hahaha! I was mentally prepared to focus on finishing and not caring about other people passing me (I am very competitive and I like to win), so I had to prepare my mind for not worrying about it. 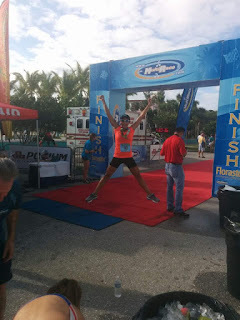 The day before the race, I went to pick up my packet and when I saw some athletes (that looked very professional) I got intimidated by the fact that I was a newbie, but once again, I was really determined to no let down my purpose and my goal. The night before the race I slept like a baby, did not have any anxiety problem at all. So I was very rested by morning race. I was happy and nervous but with the support of my family and teammates I was sure nothing bad could happen. 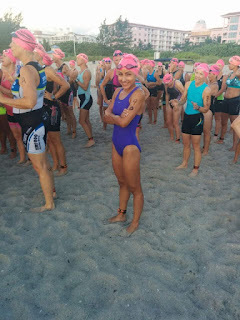 After leaving my bike and all gear at the transition area, I headed to the beach with the other athletes waiting for the call. Then the swim came, I was very relax, and focusing on keeping a decent pace that will not burn me down. My only thoughts during that moment was my stroke rhythm, is like your mind goes blank and just living that specific moment. Finished the swim among the first group of women, my husband told me he was surprised when he saw me getting out of the water LOL!. Well, even I was surprised!! !, Then came the bike, and I did it pretty good, at average of 17 mph (better that on training) and finally the run, I forgot to say that running is my strength, so I killed it (for a newbie). When I crossed the finish line, I was incredibly happy and proud of myself. My husband told me to check my group age position, I told him for what? I thought it took me a long time to finish, but guess what? I got third place for my age group!!!. It was like winning the lottery for me, I was soooo happy and immediately texted my coach with the news! Mission accomplished!